How does digital work in your learning and creative practice? 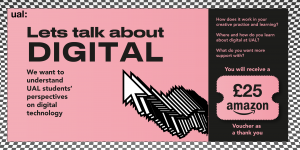 Where and how do you learn about digital at UAL? What do you want more support with? 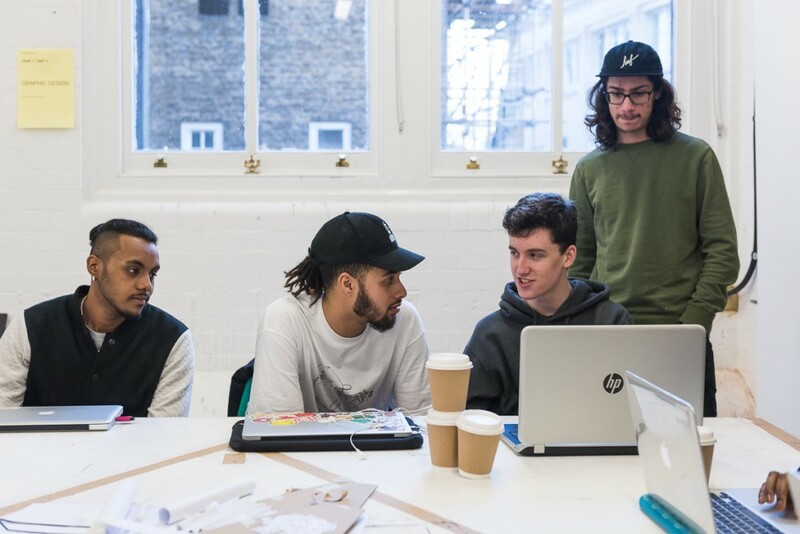 You’ll take part in a series of structured activities designed to help UAL understand how students here are developing digital skills and attributes. This entry was posted in News on November 10, 2017 by Teaching and Learning Exchange. How will the project extend excellent teaching and learning into digital spaces? How will students be equipped with ‘higher level’ digital literacies around practices and/or student identity? How will the use of digital be used to cross institutional or disciplinary boundaries? The deadline for applications to the fund is the 14th of December. Apply now. This entry was posted in News on November 17, 2016 by Teaching and Learning Exchange. Congratulations to Katie Mills, Assistant Director, Careers and Employability, who has been appointed as a Director to the board of Enterprise Educators UK. EEUK is the national network for enterprise educators, with a network of 105 member institutions. The company’s aim is to support its members to increase the scale, scope and effectiveness of enterprise and entrepreneurship education and practice. The Director role is a voluntary post with a 3 year tenure, with responsibilities including attending EEUK board meetings and in some instances representing EEUK at events or conferences regionally/internationally and to lead/support certain aspect of the EEUK programme. 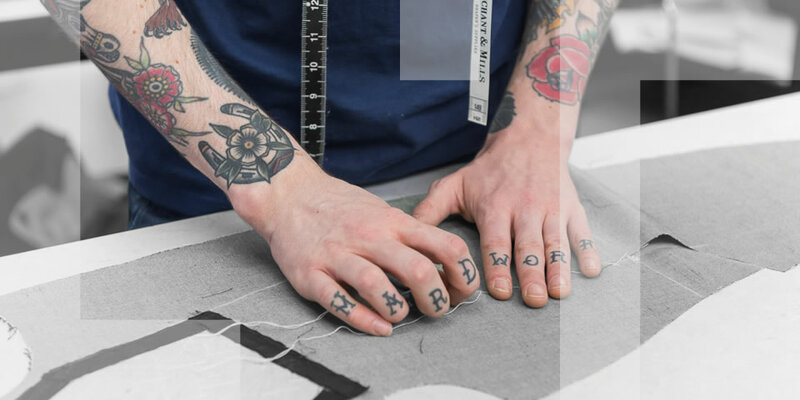 To find out more about Careers and Employability at UAL, visit the website. This entry was posted in News on October 19, 2016 by Teaching and Learning Exchange. We are delighted to announce the launch of the new Exchange website. 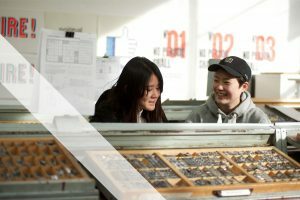 The site has been developed in response to college feedback, with the aim of situating and celebrating the Exchange as a sector leading hub for teaching and learning. We commissioned a new set of photographs and videos for the site, and are delighted with the wonderful shots and footage of teaching and learning across our colleges and our diverse disciplines. The site now offers a much improved user experience, and we hope you will find it easier and more intuitive to navigate. We hope it will become the ‘go to’ place for all things teaching and learning for colleagues across UAL and beyond. The new Exchange web pages are a real step up, both in terms of look and feel and the clarity of information the Teaching and Learning Exchange offers online. This was only made possible by the tutors, course leaders, technicians and academic coordinators across UAL who helped us shape the new content, offering their time and expertise in considering the information that would make a difference to them daily. We were led by the things you told us you wanted to see and we hope with the new Exchange pages you’re able to find more information, opportunities, contacts and events to help you to improve and develop both your teaching and your students’ learning. I am delighted that our web pages now reflect the ways that the Teaching and Learning Exchange shares, showcases and develops best practice in teaching, learning and employability by working in partnership with colleagues across our constituent colleges. These webpages truly are an exchange in the best possible sense of the word. As the site develops, we hope that staff across UAL will contribute content so that we can reflect the great teaching and learning practices taking place in the colleges. Now that we have the site up and running, we will turn our attention to finding ways to make sure we are reaching out and giving staff the opportunity to share their work. This entry was posted in News on August 5, 2016 by Teaching and Learning Exchange. Professor Susan Orr and Diane Lucas (Academic Development and Services Administrator) have been asked to lead the UAL Attainment Project: Learning For All. The project addresses attainment differentials that exist between groups of students in our university, and recognises, builds on and extends college-focused attainment work. It has a particular focus on addressing the attainment gap for Black students, international students and working class students. To support this work we have appointed Dr Gurnam Singh as a Visiting Fellow. Look out for more information about this work in the Autumn term. This entry was posted in News on August 3, 2016 by Teaching and Learning Exchange. 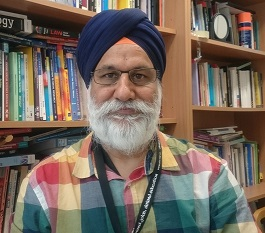 The Teaching and Learning Exchange are delighted to announce that we have appointed Dr Gurnam Singh as a Visiting Fellow. Dr Singh is Principal Lecturer in Social Work at Coventry University and Visiting Professor of Social Work at the University of Chester, and brings invaluable expertise and experience to our work at UAL. He will be the advisor/critical friend for the UAL Attainment Project: Learning for All. We are so pleased that Dr Singh will be contributing to our work on diversity, equality and attainment. This entry was posted in News on July 28, 2016 by Teaching and Learning Exchange. We are delighted to announce that the Teaching and Learning Exchange and CSM will be co-hosting the ELIA (European League of Institutions of Arts) Academy Conference on 5-7 July 2017. Titled: What’s going on here: exploring elasticity in teaching and learning in the arts, the conference will focus on teaching and learning in the arts, with sub themes on curiosity, research, social change and hybridity. Dr Silke Lange (Associate Dean Learning Teaching and Enhancement at CSM) and Professor Susan Orr are keen to bring in contributions from students and staff across UAL and will be setting up a UAL group to support the steering group’s work. We will post further information about the conference shortly, but in the meantime have a look at this short video from last year’s conference in the Netherlands to give you a flavour of the event. Several UAL colleagues attended the conference last year and were very impressed with the quality of debate and the creativity of the workshops and speaker contributions. As a result of our experience we pitched to ELIA and are pleased to bring this important teaching and learning international conference to UAL in 2017. A number of staff members who recently received UAL Teaching Awards have attended Graduation and celebrated their achievements. 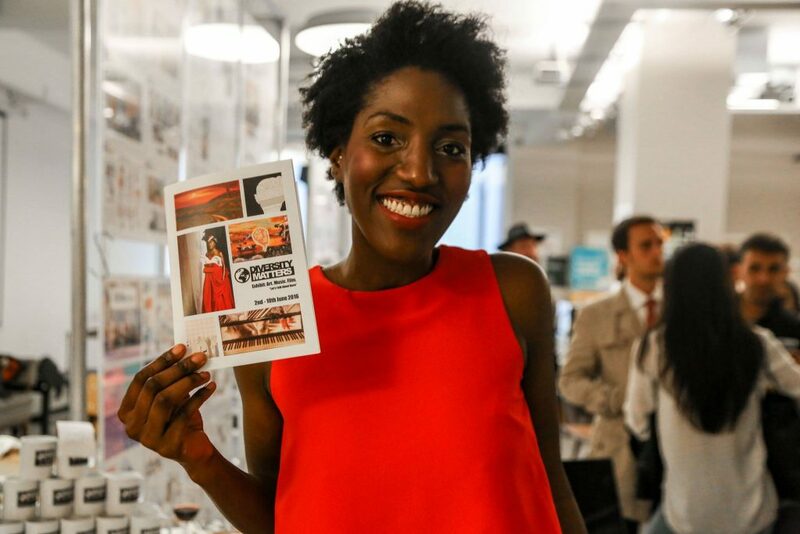 Among them was Elizabeth Staddon, Head of Arts Education at the Exchange. 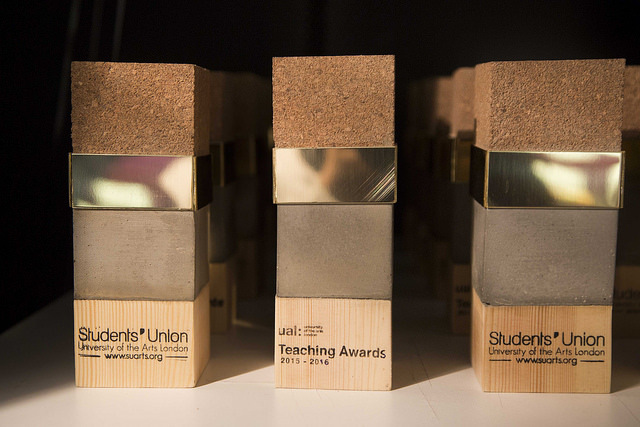 The UAL Teaching Award, run by UAL’s Student Union, allows students to nominate staff who have demonstrated excellence in their teaching. Elizabeth teaches on our MA Academic Practice in Art, Design and Communication. Elizabeth was right there with us through our course. She was genuinely interested in all our projects, and shared our many trials and triumphs as we stumbled our way through the difficult MA dissertation process. As a tutor she manages to strike the perfect (difficult to pull off) balance between support and challenge. She is a fount of pedagogic knowledge, but wears it lightly, as if to reassure the learners that we are all in this together. It truly felt like we were! Beyond that, she is an inspirational female teaching role model – one of the very few people in UAL with whom I am able to share the tedious but very real struggles of managing family, study, research and work. Those snatches of conversation may seem trivial to others, but they are actually a lifeline. If Elizabeth can do it, so can I! Elizabeth runs the Dissertation unit on the MA. In tutoring our cohort through it last year she created a safe space for the discussion and development of our ideas, allowing us to share our knowledge and research journeys. This was one of the most important aspects of the process for me; and I would speak for my peers here too. Elizabeth was interested in each of our projects: listening, encouraging, questioning, challenging – and even bringing us texts she thought would inspire. Aside from the supportive group seminars she established, she was always willing to meet us to discuss any problems we might be having with our research, so that we felt fundamentally supported. It seemed that she was genuinely interested in what we were doing; and made us feel that it was worthwhile. This attitude to learning and teaching is one which others would seek to model. Elizabeth embodies the qualities I admire, and it was a privilege to spend time under her supervision. It is an absolute privilege to be recognised as a teacher at UAL and I am touched that students have taken the time to express their gratitude. I don’t think we teach for the praise, but it really is lovely when we get it! Two very talented students, Chin Chin Lam and Kajsa Lilja, from LCC BA Spatial Design created the Teaching Award trophies. They filmed a video showing the design and making of the trophies. To find out more about staff who received awards in 2015-16, visit the SU website. This entry was posted in News on July 22, 2016 by Teaching and Learning Exchange. 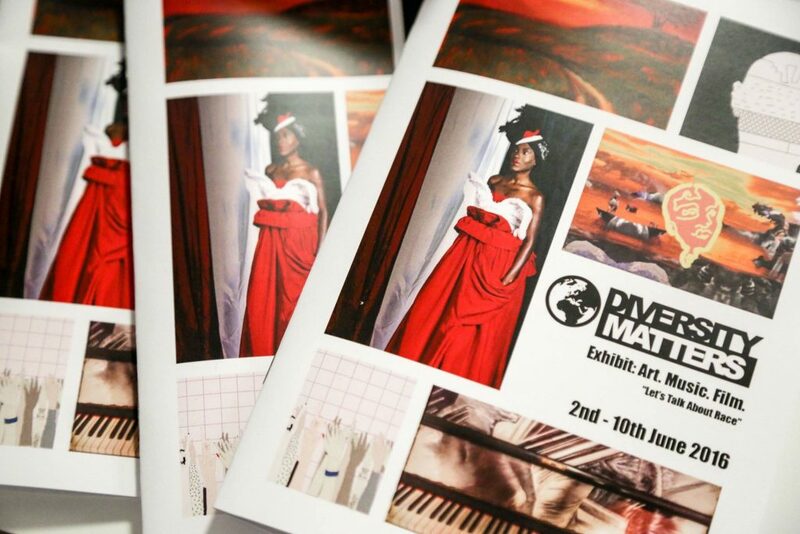 Following on from Diversity Matters Awareness Week in April, which was funded by the Teaching and Learning Exchange’s Student-Staff Collaboration Fund, Diversity Matters Exhibit followed in suit to continue the discourse around race matters – this time by fusing music and art. Diversity is a topic that many people find difficult to tackle, but when a student leaves home to begin their University education, they can start to feel marginalized for many reasons, including their race. One UAL student has felt the need to spread the word on the issues facing the BAME community in education by single-handedly trying to champion the message for building awareness, as well as helping communities around the world. After the success of Diversity Matters Awareness Week, Kai has since gone onto set up Diversity Matters as a student-lead platform to make a big difference beyond education, and recently curated and launched an art exhibition Diversity Matters Exhibit at UAL with contributions from a diverse group of students and artists. 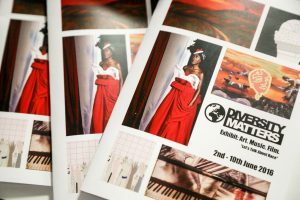 Diversity Matters Exhibit was also a fundraising collaboration between Kai’s art workshop platform Art4Change, which aims to work with marginalised communities around the world and Pianist Without Borders artist Fabio Tedde. 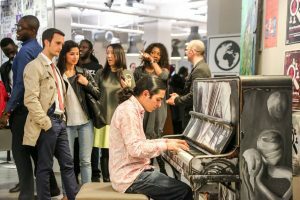 The theme of music was highlighted in the exhibition beautifully with a show-stopping piece of art in the form of a piano decorated by Italian artist Riccardo Girardi. Find out more at www.Diversity-Matters.org.uk and check out the video from the evening. This entry was posted in News on July 6, 2016 by Teaching and Learning Exchange. The Widening Participation and Diversity teams are now inviting Course Directors from across UAL to nominate students for the University’s Tell Us About It project. This project focuses on Home students from Black and Minority Ethnic backgrounds, who are completing their course, and who have achieved to a high level. Nominated students will be invited to record or present their experiences, in their chosen form, to add to a collection of case studies which inform learning and teaching across UAL. Students will be provided with mentoring to produce their story and a bursary of £200. Course Directors can nominate one student per course using the online nomination form. We are keen to have nominations from HE courses from across the University. Closing date for nominations is 8 July 2016. Please complete the online nomination form to nominate a student. For enquiries, contact Terry Finnigan, Head of Student Attainment LCF: t.finnigan@fashion.arts.c.uk. This entry was posted in News on June 9, 2016 by Teaching and Learning Exchange.